I love happy accidents in the kitchen. We needed to bring a side dish to family dinner and had a lot of asparagus, tomatoes, and Gouda cheese leftover. Once we added a few more ingredients, it made a super DELICIOUS pasta salad! 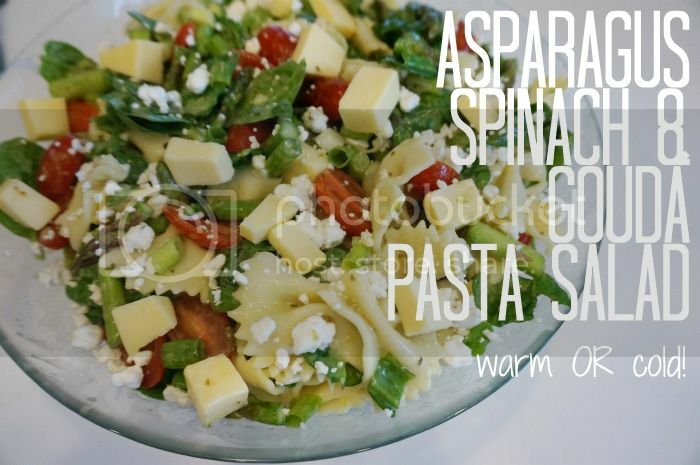 You can make it cold like traditional pasta salad, or roast up the asparagus and tomatoes and add the rest of the ingredients when the pasta is still warm, throw on some grilled chicken and you have yourself a meal! *If you're not a fan of Gouda or goat cheese, skip it and add shaved parmesean instead! Boil pasta according to instructions, about 10 minutes until cooked. Drain pasta and put in large bowl. Add 1/3 of the bottle of dressing to the noodles, mix, and let the noodles cool to room temperature. Chop up asparagus, tomatoes, green onions, and Gouda cheese. Add to pasta. Cut asparagus and tomatoes. Toss with olive oil, salt and pepper and roast in oven on foil lined baking sheet for 12-15 minutes until veggies are roasted, but not too brown. While veggies are roasting, boil pasta according to instructions, about 10 minutes. Drain pasta and put in a large bowl. Add 1/3 of the bottle of dressing and spinach to the noodles and toss. Chop green onions and Gouda cheese. Add all ingredients to warm pasta and toss.